Now that you understand types of risk and investments, you’re ready to build your portfolio. Your “portfolio” refers to your entire collection of investments, just as all the different clothes in your closet constitute your “wardrobe.” Portfolios are usually described in percentage terms, such as a portfolio with 60% invested in stocks and 40% in bonds. Remember the different types of investments you could make? It’s time to figure out how much of each you want to own. Your asset allocation will change over time: As you edge closer to retirement, your investment timeline and risk tolerance will decrease—and you’ll likely sell some of your stocks and buy more bonds. One rule of thumb for determining your asset allocation is to subtract your age from 110. The result is the percentage of your portfolio that should be in stocks. 85% of your assets in stocks and the remainder in bonds. 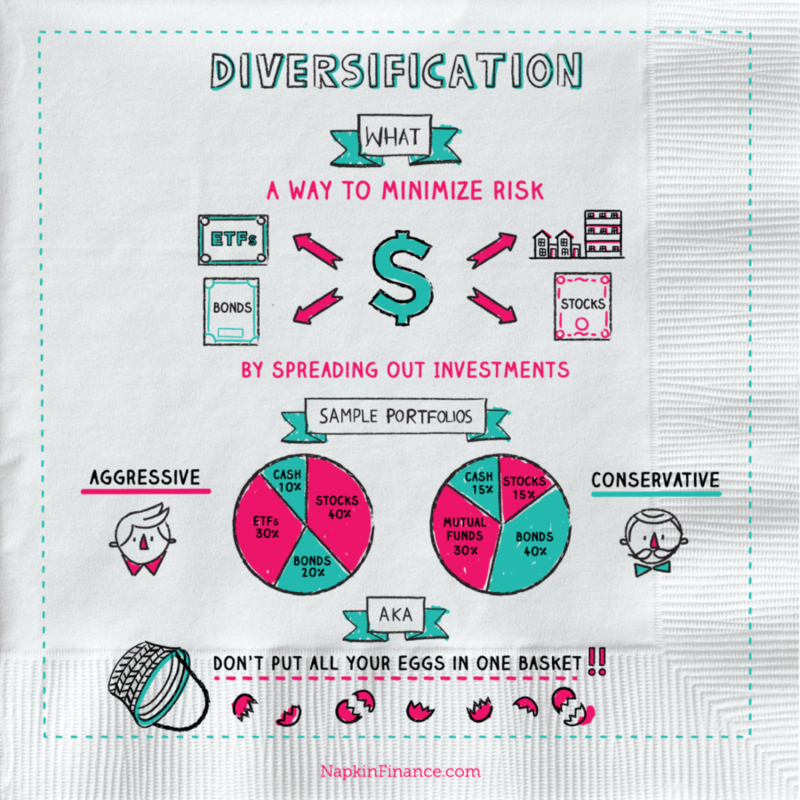 Diversifying is the investing equivalent of spreading your eggs around with different baskets. If one stock or one part of the economy suddenly tanks, you want to hold other bets to help smooth your portfolio’s returns. Minimizing risk: If one investment has a bad year, or even goes to zero, it doesn’t take your whole net worth with it. Smoothing returns: Holding investments that don’t all fall or rise at the same time can steady your portfolio’s overall returns. Across asset classes: Invest in a mix of stocks, bonds, and alternatives. Within asset classes: Hold government and corporate bonds, dividend- and non-dividend-paying stocks. Geographically: Consider investing all around the world. Across industries: Try to invest in a cross-section of the economy. Combining these approaches can help you build a rock-solid portfolio. Over time, your portfolio will shift as the market shifts. If stocks have a strong run, for example, a portfolio that starts out with a 60% stocks 40% bonds mix could end up with a 70% stocks 30% bonds mix. That’s where rebalancing comes in. In the above example, you could rebalance by selling 10 percentage points of your stock holdings and putting that money into bonds to restore your 60/40 mix. Consider rebalancing once a year or whenever an investment strays by at least 5% from its intended allocation.